September 27, 2013 It Was a Fast Start and Great Finish For Gearge J., Wife Lannet and Son Lance!!! September 27, 2013 It Was a Fast Start and Great Finish For Gearge J., Wife Lannet and Son Lance!! We had some nice 5 lb Bronze Beauties first thing and the tide quickly slowed to a trickle but after lunch it picked up and some birds started working and helped us put some nice trout in the box! Thank you for the wonderful Fishing trip yesterday. As you said, “You’ will work harder than anyone and that was especially true with us”. Also, tell your wife she has the cleanest and most comfortable lodging…. September 25, 2013 Leighton M & Friends Allen & Adams Catch a Nice Mess of Lake Calcasieu’s Finest!!! 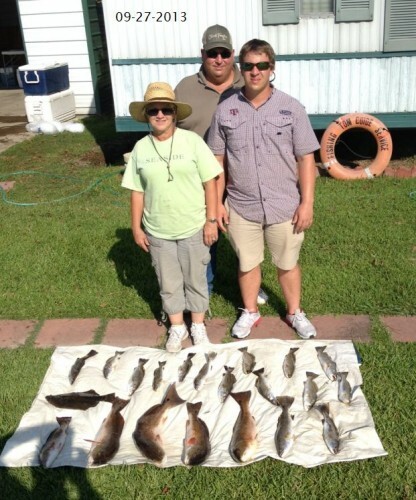 September 25, 2013 Leighton M & Friends Allen & Adams Catch a Nice Mess of Lake Calcasieu’s Finest!! It was a challenge with a cold front that passed last night bringing strong high pressure and a north breeze . But these guys worked hard and put these nice Bronze Beauties in the box!!! 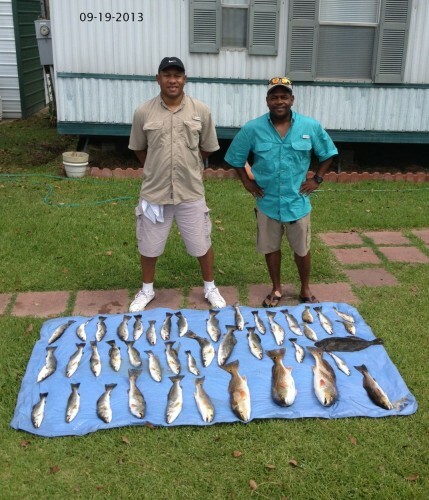 September 21, 2013 Clayton J. and Fishing Partner Jeff Catch a Nice Mess even in the wind and after 5 Inches of Rain!!! 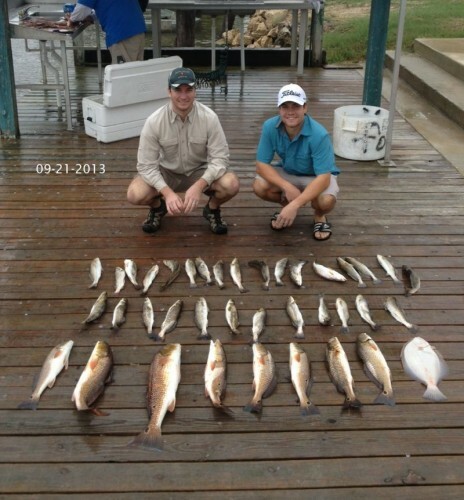 September 21, 2013 Clayton J. and Fishing Partner Jeff Catch a Nice Mess even in the wind and after 5 Inches of Rain!! This Nice 7 lb Bronze Beauty was Big Fish of the day !!! 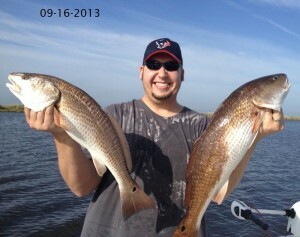 September 19, 2013 Paul S & Fishing Partner David Have a Great First Trip to Lake Calcasieu!!! 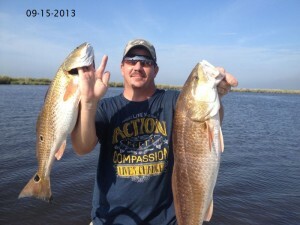 September 19, 2013 Paul S & Fishing Partner David Have a Great First Trip to Lake Calcasieu!! Live Shrimp and a slow but staedy bite filled the cooler with a nice mess of Big Lake Silver Bullets!!! 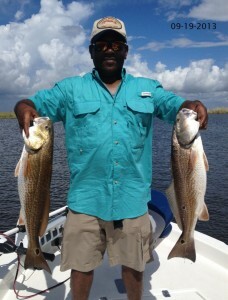 David caught these 2 7 lb Reds for the big Fish of the Day!!! 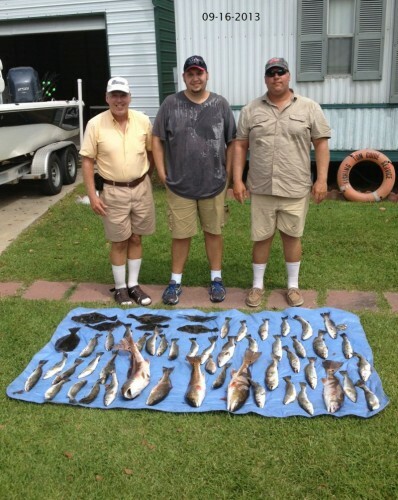 September, 15, 2013 Captain Tom, & Sons Tommy & David Have a Day to Remember on Lake Calcasieu!!! 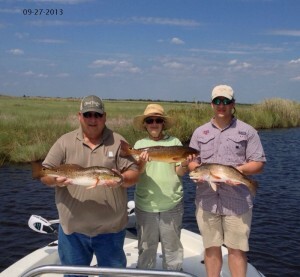 September, 15, 2013 Captain Tom, & Sons Tommy & David Have a Day to Remember on Lake Calcasieu!! 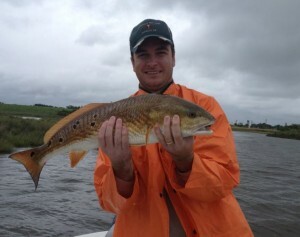 It started with some Nice Trout under the birds and moved to some Big Reds and Flounder in the marsh. 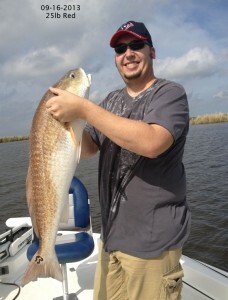 David landed this nice 25 lb red(His Biggest Ever!) Plus some 10 & 12 pounders for good measure! 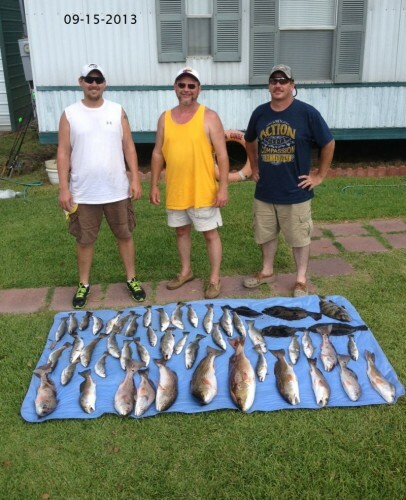 September 15, 2013 Steve H., Son Josh and Son in Law Kendall Whoop Em on Day 2 at Lake Calcasieu!!!! 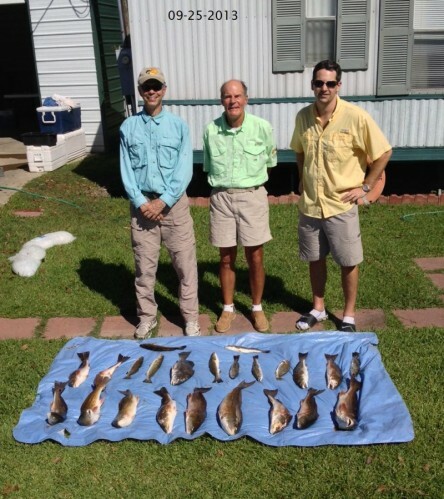 September 15, 2013 Steve H., Son Josh and Son in Law Kendall Whoop Em on Day 2 at Lake Calcasieu!!! Slow & steady was the theme today with a nice mess of Specks and some 10 & 12 lb reds for Kendall and it was slams all around with some nice Hackberry Halibut to top off a great trip!! !